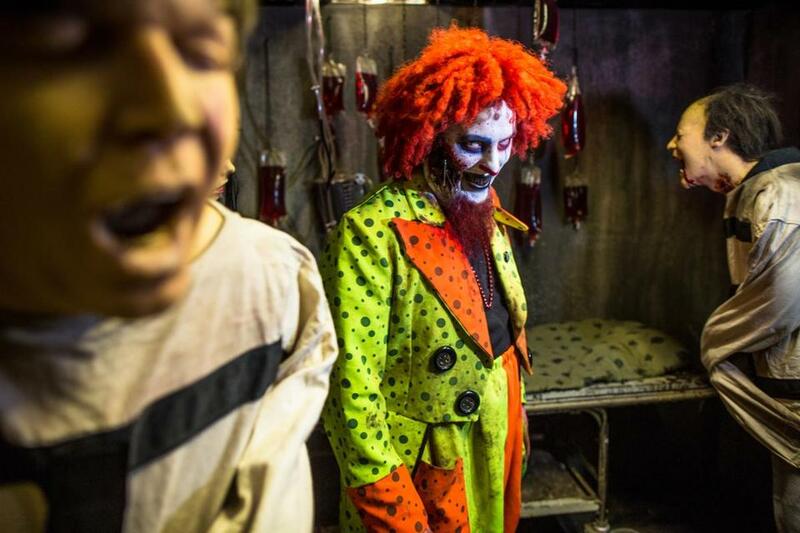 Should haunted houses ‘send in the clowns’ this Halloween? 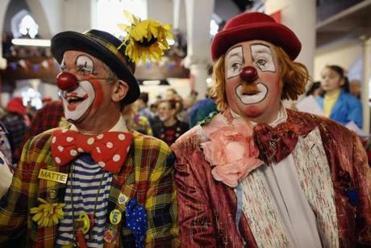 Clowns will remain at Barrett&apos;s Haunted Mansion in Abington this year. When the First Parish Haunted House in Bedford opens on Friday, Oct. 28, it will be filled with monsters, ghouls, and horrors, but some particular freakish frights will be missing. Clown hysteria has brought an early, and often unwanted, start to the usual terror of Halloween. Since August, police in at least two dozen states have received reports of people dressed as creepy clowns lurking in the shadows, trying to lure children with candy, or chasing unsuspecting people. Massachusetts hasn’t been immune, with schools in particular vulnerable to sham or real clown sightings. So the debate within haunted house circles this year is whether someone in a harlequin costume with red nose, exaggerated makeup, and a particularly bad wig is simply too terrifying for an audience that has grown immune to skeletons, ghosts, and gore. A look at the news and events shaping the day ahead, delivered every weekday. Some haunted houses in the area have no intention of pulling the clowns from their attractions, though the phenomenon has made them more cautious than in years past. Can we send the clowns OUT, please? More unnerving clown sightings are reported locally, a thief takes a tumble, and other odd tales from local police blotters. Mary Barrett-Costello, owner of Barrett’s Haunted Mansion in Abington, said clowns are integral to the 25-year-old attractionand will remain this season to creep around and creep guests out. First Parish Haunted House takes a different tack, opting for a less terrifying Halloween. Over seven Halloween seasons, the haunted house has found a way to strike the balance between frightening and family friendly. Last year, more than 800 people visited the Bedford church as part of its fund-raiser, where the decor harkened back to the era when Bela Lugosi played Count Dracula. This year’s theme is the “Bedford Alchemy Society.” Guests will be led through themed rooms on three different floors and will have the chance to interact with various alchemists, their creations, and the magical creatures they’ve collected from around the world. 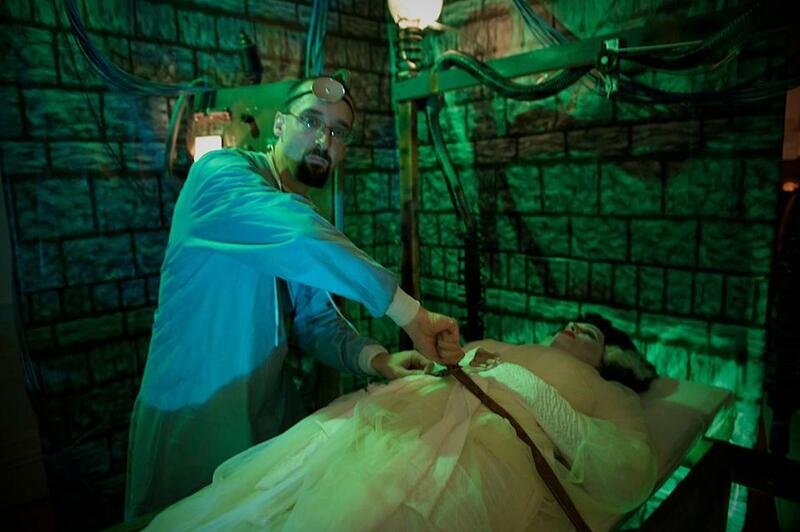 Over at The Newton Haunted House in Newtonville, Lisa Feldman Barrett uses science — not blood or guts — to scare guests. This is the 12th year that Barrett, a neuroscientist who heads the Interdisciplinary Affective Science Laboratory at Northeastern University and Massachusetts General Hospital, has run the haunted house out of her home. The one-night charity event, which will take place on Oct. 28 this year, raises thousands of dollars for the Greater Boston Food Bank. Barrett’s daughter, Sophia, had the initial idea for the haunted house when she was 5 years old. To make the haunted house scarier without resorting to gore, the family has used Barrett’s research about how the brain generates emotions.. The house has three “scare” levels — no scares, medium scares, and full scares — to cater to every type of guest. At the first level, actors stand completely still and will unmask at the guests’ request. At the next level, actors will lightly brush against visitors and move about in a creepy manner. And, in the most extreme version, actors leap out unexpectedly and grab guests by the arm. But no matter the scare level, there is one consistent theme inside. First Parish Haunted House in Bedford is filled with monsters and ghouls, but no clowns. Allison Pohle can be reached at allisonpohle@gmail.com.